Background: The 601 brand, out of Espinosa Cigars, has been one that falls into the more interesting category of things. Their lines are solid, but what will often draw people to it are products like the La Bomba, which feature a very long pigtail – supposedly for lighting it like a stick of dynamite. 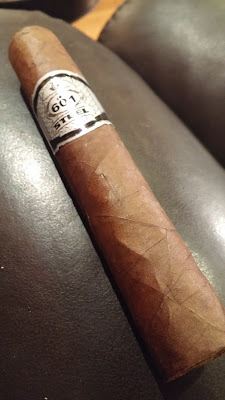 The cigar for today, the 601 Serie Steel Rod is a more traditional cigar offering, but it is a Famous exclusive. Appearance (0-20): There is a lot to like about the looks on this cigar. The habano wrapper on it has a nice rich Oscuro color. It’s offset by a black and silver band with the standard 601 emblem and a “Steel” proclamation across it. The background of the label shows patterned steel to finish out the look. There are some smaller veins visible throughout but nothing that would cause any concern and the wrap job is clean. Construction (0-20): When picking this up, you’ll notice the outer wrapper is silkier than anything. The packing feels firm, with a slight amount of give to it. As noted above, there are no imperfections to note. The initial cut only had a small amount of debris, thus speaking to a solid pack job. When smoking, however, it was a slight bit tight for a majority of the smoke. The ash held for an adequate amount of time, so no issues there either. Strength (0-20): Dropping directly into the full strength portion of the scale – exactly where you would expect. Flavor (0-20): Initial blasts of pepper are heavy and fast for this 601, hitting you immediately and continuing throughout the first third. That’s not entirely shocking considering each of the 601 blends we have tried in the past have some manner of pepper kick (Serie Green Tronco Habano, Serie Blue, Serie White). Behind the pepper sets an earthy backdrop that helps to mellow things a bit, though it really is just a backdrop. As the first third closes out, the pepper fades back quickly and it is replaced by a really nutty flavor against that same earthy taste. There are some slight hints of other spices at this point (think nutmeg and leather) but nothing very consistent or worth noting. The final third sees the pepper return, but in a lesser extent, to match with the nutty and earthy mixture that was seen mid-cigar. Value (0-20): One of the principal ways we look at value is to question if you would buy this again at all, and if you would buy it over something else at a similar price. For this one I would definitely give it another purchase, if in the mood for it. Otherwise, there are a number of other cigars I would veer toward on a much more frequent basis. 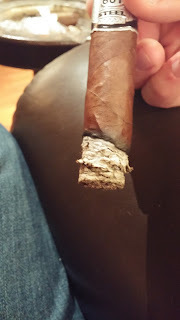 Overall (0-100): I can say I definitely enjoyed this smoke, though with a few slight reservations. 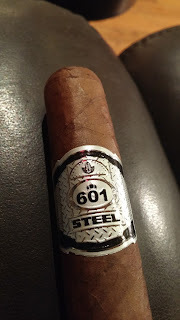 The 601 Steel Rod really packs a lot of punch for your buck, with some heavy pepper, nuts, and earth. There are some minor and nearly indeterminable spices that will pop up, but the cigar is somewhat straightforward as opposed to being more complex. Still, it’s well made with an above average appearance. The one sticking point may be the price. It’s not outlandish by any means, but it’s a hair on the high side for this to be a regular smoke for me. Taking it all down to the barebones: this is a good smoke for those who enjoy something heavier, and a decent price for your return… but it’s a Famous exclusive so if you want one, you will need to head over there for this pepper kick.